ForeScout has pioneered an agentless approach to network security to protect organizations against the emerging threats that exploit the billions of IoT devices connected to organizations’ networks. This solution is based on the ability to see, control and orchestrate. 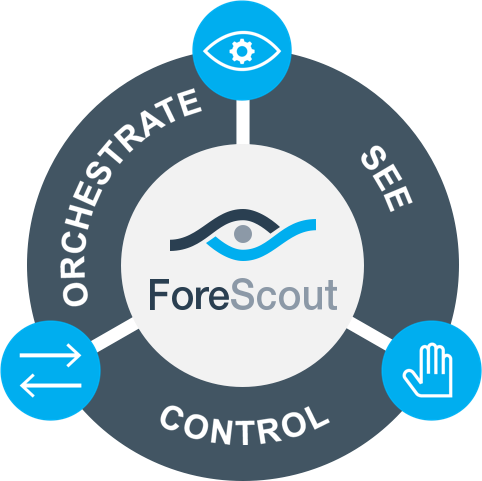 ForeScout CounterACT® sees desktops, laptops, tablets, smartphones, IoT endpoints, peripherals and rogue devices the instant they connect to your network—even if they don’t have security agents installed. It discovers servers, routers and access points, too. CounterACT gathers in-depth insights about device types, users, applications, operating systems and more. Then it continuously monitors the devices. No agents. No excuses. No kidding. Unlike solutions that simply provide alerts and send IT scrambling, CounterACT allows, denies or limits network access based on device posture and your security policies. It can also automatically assess and remediate malicious or high-risk endpoints to help you comply with industry mandates and regulations. You don’t need to change your network on our behalf. We work with wired and wireless network infrastructure, as well as Windows®, Linux, iOS®, OS X and Android. Chances are, if you have it, we work with it—including your existing security management tools such as NGFW, EDR, EPP, ATD, EMM, VA and SIEM. Our solutions enable over 70 third-party systems* to share data to gain better context of device posture and orchestrate an automated response which extends the value of your existing security investments. ForeScout CounterACT was extremely easy to deploy.